FRIDAY HARBOR, Washington, December 5, 2012 (ENS) – Captain Paul Watson, founder and president of the marine wildlife conservation organization, Sea Shepherd Conservation Society, has resurfaced at the helm of his own ship after months on the run. He left Germany in July to avoid extradition to Costa Rica over the interception of a shark-finning vessel 10 years ago. Watson this week joined the crew of the SSS Steve Irwin and the rest of the Sea Shepherd fleet in international waters to take command of Operation Zero Tolerance, the non-profit’s ninth campaign to defend Antarctic whales from Japanese whalers in the Southern Ocean Whale Sanctuary. He now commands a fleet of four whale defense ships with officers and crews of 120 people from 24 nations. He also commands a helicopter, drones and eight small boats. Watson will use all these resources to intercept and intervene against the intent of the Japanese whaling fleet to kill 1,035 whales in the Southern Ocean Whale Sanctuary this whaling season, which starts within the next few weeks. Sea Shepherd will not only endeavor to save the lives of whales, but also to bankrupt the Japanese whaling industry. Last year, Sea Shepherd cost Japan’s whaling agency, the Institute for Cetacean Research, US$20.5 million in losses despite the fact that the ICR received a $30 million dollar subsidy originally appropriated for the victims of the Japanese Tsunami Relief Fund. “Sea Shepherd has clearly succeeded in sinking the whaling fleet economically; now the group intends to sink them politically,” said Watson. Watson has been at sea since July 22, when he forfeited his bail and left Germany. He was arrested in Germany at the request of the Costa Rican authorities. “It has been seven months since the Germans detained me at Frankfurt airport and four months since I left Germany,” Watson writes on the Sea Shepherd website. Operation Zero Tolerance will be Sea Shepherd’s biggest campaign yet to defend at-risk whales. 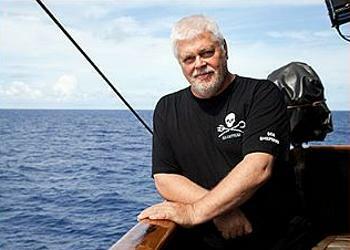 Sea Shepherd’s ships and crew are currently positioning themselves for the campaign. The SSS Steve Irwin, with Captain Watson again at its helm, is at sea. The SSS Bob Barker, with Captain Peter Hammerstedt of Sweden and the United States in command, departed on November 30 from Sydney, Australia. The SSS Brigitte Bardot, captained by Jean-Yves Terlain of France is also at sea. The yet-to-be-unveiled SSS Sam Simon remains in an undisclosed location with Captain Locky MacLean, a citizen of both France and Canada, in command. The Sea Shepherd’s new practice of using the ship prefix SSS to indicate a Sea Shepherd ship makes it easier to identify the vessels, each of which is named in honor of a well-known person, such as the late Australian broadcaster and conservationist Steve Irwin. During the past eight seasons, Sea Shepherd’s direct-action interventions have saved the lives of more than 3,600 whales and exposed illegal Japanese whaling to the world. This year, the group’s campaign is called Operation Zero Tolerance because it aims to intercept the whaling fleet and send them home before they have a chance to make a single kill. Japan claims that its research whaling program is legal, although in 1986 the International Whaling Commission introduced zero catch limits for commercial whaling. The moratorium was imposed to allow the great whales to recover after many species hovered on the brink of extinction after centuries of whaling. The zero catch limit is still in place today, although the Commission continues to set catch limits for aboriginal subsistence whaling. Japan has been conducting research whaling since 1987, using the idea of a Japanese traditional whale meat diet to make its case for whaling. “In Japan, the demand for whale meat is dropping and traders are reluctant to engage in commercial whaling. So, a continuation of research whaling may be the only way of keeping the practice going,” a Japanese scientist told NHK TV in March. Ayako Okubo, an anti-whaling researcher and author who once served as an observer at the International Whaling Commission, maintains that the “tradition” argument is just a political ploy. The incident for which Captain Watson was arrested and detained in Germany took place in Guatemalan waters in April 2002, when Sea Shepherd encountered an illegal shark-finning operation run by the Costa Rican vessel, the Varadero I. On order of Guatemalan authorities, Sea Shepherd instructed the crew of the Varadero I to stop shark-finning and head back to port to be prosecuted under a Costa Rican law forbidding shark-finning passed in 2001. While escorting the Varadero I back to port, the tables were turned and a Guatemalan gunboat was dispatched to intercept the Sea Shepherd crew. The case was closed for 10 years and then reopened, Watson believes because of pressure from Japan. If Watson were to go to jail in Costa Rica, he says the shark-fin mafia would kill him to collect the US$25,000 bounty on his head. However, Costa Rica has just closed the loopholes in its previous shark-finning law. On October 10, President Laura Chinchilla signed an executive order banning shark finning in the Central American nation’s coastal waters. In September, Interpol published a Red Notice, or international wanted persons alert, for Watson at the request of Japanese and Costa Rican authorities. Watson believes that Japan’s real reason for requesting an Interpol Red Notice is to prevent him from attempting to interfere with their whaling fleet, but that strategy has not worked.